Specializing only in the works of Eric Sloane since 1996. 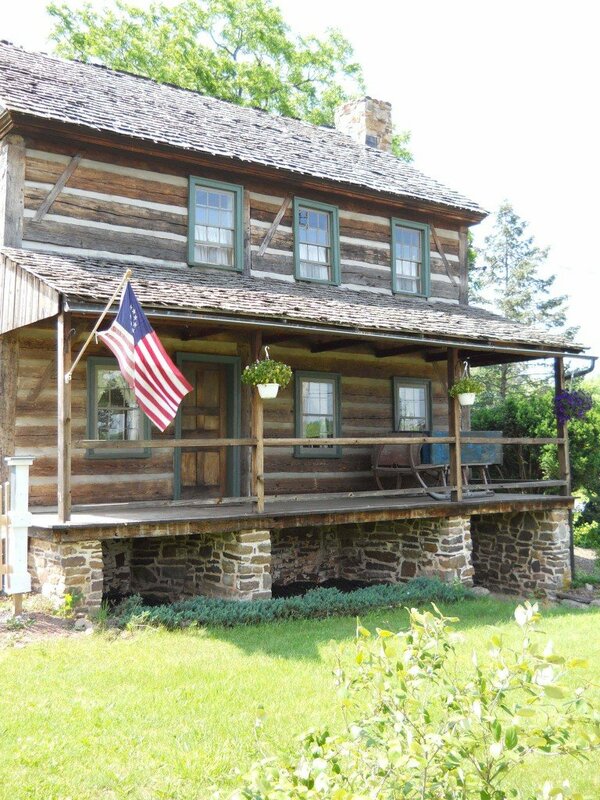 We are located in an historic 18th century post and beam log home just outside of Lewisburg, Pennsylvania, a delightful college town recently nominated to the National Register of Historic Places and home to Bucknell University. We are approximately 3 hours from New York City, Baltimore, Philadelphia and Washington, D.C. We specialize in the works of Eric Sloane, N.A. (1905-1985). We purchase, sell, authenticate, restore and appraise works by Eric Sloane. Weather Hill Farm is owned by James Mauch, the author of Aware: A Retrospective of the Life and Work of Eric Sloane. James is an authority on the artistic works of Eric Sloane and is the founder of The Friends of the Eric Sloane Museum, a non-profit group to support the mission of The Eric Sloane Museum of Kent, Connecticut. We seek those works by Sloane which represent the highest levels of his skills, works in which we have the utmost confidence in the quality, condition, emotional impact, and current and future value – and we use our own capital to do so. Should you have a painting, print, or illustration by Eric Sloane that you are considering selling, please contact us. We provide prompt, courteous, professional and confidential service, always take the time to answer your questions, and always treat you honestly and fairly. We invite you to read more about Eric Sloane in the excerpted biography that follows and to follow our discussions via the Eric Sloane blog. Pictured throughout our website are just some of the examples of his work that are currently for sale or that we have recently sold. We have many more Eric Sloane items for sale than are pictured – books, plates, prints, illustrations, and paintings. Typically, we obtain works by Sloane that are sold before we are able to bring them to a (wider) market. 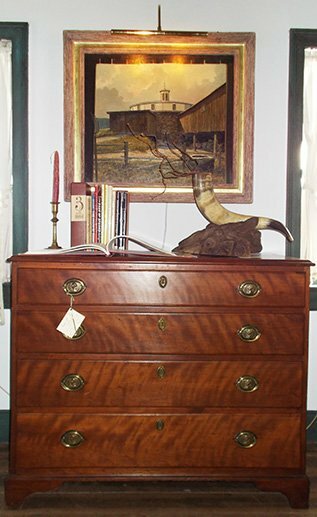 We strive to bring to our clients unique and unusual items as well as “new to market” paintings of exceptional quality to appeal to the discriminating collector. We look forward to your visit. Born Everard Jean Hinrichs on February 27, 1905, Eric Sloane spent the majority of his youth in New York City (until 1919) and on Long Island, New York. His father, George Hinrichs, Sr., grew prosperous as a meat and dairy products distributor in the city. Eric Sloane’s younger sister Dorothy described Eric as mischievous and often careless with possessions, but in the end always lovable and eager to please. An early interest in art was sparked by neighbors Herman Roundtree and Fred Goudy. Roundtree’s illustrations for magazines like Field & Stream made Eric Sloane dream of becoming a nature artist and Goudy’s printing and typesetting made Eric consider becoming a printer. As Eric grew into adolescence, he dabbled in commercial art by designing and selling signs and print advertising for local businesses. He enrolled in the Art Students League of New York City for Saturday classes. Although no formal record exists of his attendance, Eric did state on a subsequent application to the New York School of Fine and Applied Art that he studied art through the Art Students League for two months. It was during his tenure at the Art Students League that Eric overheard a conversation between John Sloan and George Luks in which the two teachers were discussing the merits of working under an assumed name. Sloan and Luks agreed that it would be better for a young artist to assume a name, then once he perfected his technique and talents revert to his given name, severing his association with earlier (and presumably inferior) works. Impressionable young Everard J. Hinrichs decided to borrow his teacher’s last name and add an “e” to the end of it so as not to claim a familial relationship. He did not assume his new moniker immediately and spent years using both names – Eric Sloane to new friends and acquaintances and Everard Hinrichs to family members and on legal documents. He later stated that he chose “Eric” because the name formed a portion of the word “America”, but his choice likely had more to do with escaping the anti-German sentiment of the day by corrupting the name “Everard”. Eric’s fragile world began to crumble in November of 1922 when his mother, largely the most stable influence in the Hinrichs household, died from complications related to a long illness. Eric stayed in the Long Island home until the summer of 1925, but it is easy to believe that the home was less than peaceful. A number of events to which an older Eric Sloane would attribute significance flashed by in rapid succession. The first was his enrollment in The New York School of Fine and Applied Art on January 22, 1923. He was officially enrolled for a semester, though he was often absent and seldom turned in any work. He ran away to Ohio and Pennsylvania during the summer of 1923 (in later years Eric wrote and spoke of running away from home to Taos, New Mexico and used the years 1923 and 1925 interchangeably as the year he made his journey westward), returning to enroll in the fall semester at The New York School of Fine and Applied Art. He officially left the school on May 24, 1924, receiving no letter grades as a result of his absences. In September of 1924, Eric enrolled in Yale University’s School of Art, yet he barely managed to complete the academic year. By the summer of 1925, Eric Sloane had made up his mind to leave home for good. He packed what amounted to a combination easel and sleeping cot, stole the family’s Model T Ford and headed west. His experiences during his travels made an indelible impression on his mind, creating a visual palette he would return to repeatedly throughout his career. He made it as far west as Taos, New Mexico, where he rented a room from Russian painter Leon Gaspard. It was in Taos that Eric fell in love with the sky and a new medium with which to try to depict the brilliant colors of the southwestern sky – oil paints. Eric Sloane returned to Long Island with his first wife Fredginia LeRouge in the summer of 1927. The reason for his return is not clear, though it is known that his father was quite ill at the time. Eric and his new wife accompanied the elder Hinrichs to various spas in the Midwest in an attempt to help him recover his health. When his father died on July 3, 1929, Eric once again took to the road. Although he had inherited the Long Island home and a considerable amount of money, creditors were able to secure most every dollar. Penniless, Eric returned to Taos. From 1929 until 1933, Eric Sloane worked in Taos, supplementing his meager income as a tour guide with proceeds from the sale of sketches and drawings rendered in colored chalk and pencils. As he developed artistically, Eric theorized that a return to New York City might launch his artistic career. When he did return, he found work through a friend at the Coney Island Amusement Park, painting murals and designing the visual components of rides and amusements. He also found work at the Half Moon Hotel, which had the distinction of being the hotel nearest to Roosevelt Field. Since pilots and mechanics frequented the Half Moon’s restaurant and lounge, Eric started painting aviation-related murals on the restaurant walls. Soon, pilots who admired the young artist’s works invited him to the airfield, eventually hiring Eric to paint fuselage art and aircraft registration lettering. Not satisfied with just lettering aircraft, Eric began painting them. He often sold them to the pilots who flew the airplanes depicted in the work. Sometimes, Eric Sloane would exchange his art for rides. Once Eric was in the clouds, his world changed. He began to paint larger and more detailed paintings of aircraft and clouds. The airplanes became smaller as the clouds grew larger. 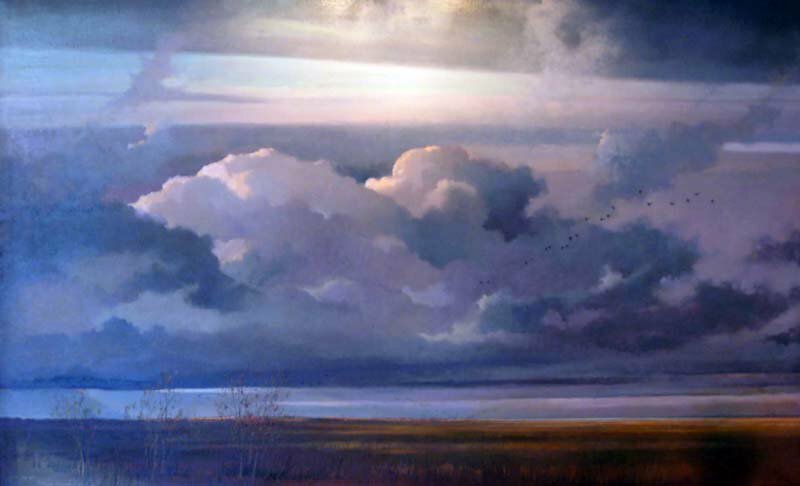 He reached a point where he was painting large “cloudscapes” devoid of any aircraft at all, to which a friend asked as he viewed a Sloane cloudscape, “Who is going to buy a painting of just clouds?” Undaunted, Eric hung it for sale at the Roosevelt Field Inn for what he termed an “exorbitant amount”. Aviatrix Amelia Earhart bought the painting. By 1940, Eric Sloane had earned a reputation as a skilled painter of the sky. He was commissioned to draw several illustrations for two flying-related books, Your Wings by Assen Jordanoff and Earnest Vetter’s Let’s Fly: An ABC of Flying. 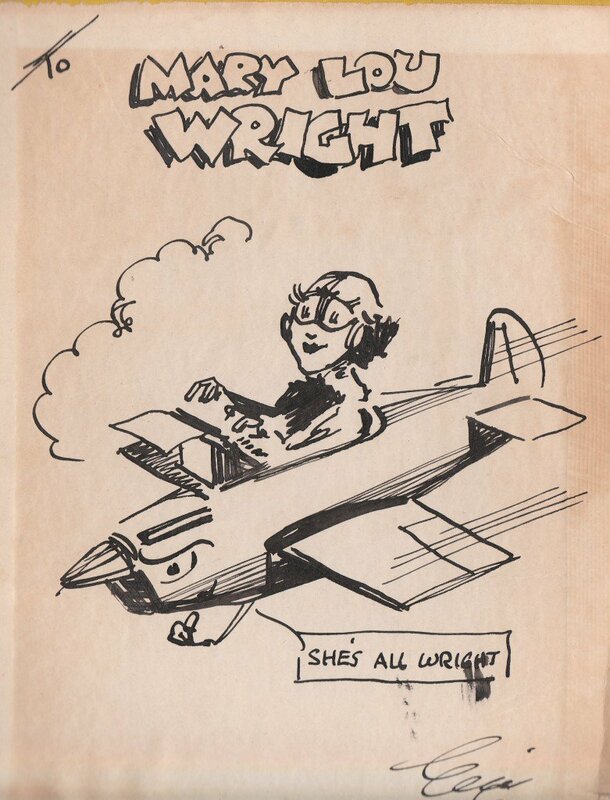 His engaging style of illustration prompted the Devin-Adair Company to contract him to write and illustrate his first book, Clouds, Air and Wind(1941). The success of the book prompted the Army Air Corps to hire Eric Sloane to write and illustrate several publications. Pictured at right: Signed and inscribed copy of The Gremlins Will Get You If You Don’t Watch Out!, published by B.F. Jay & Co., 1943. Sorry – Sold. During the Second World War, Sloane took a brief hiatus from writing after an acquaintance’s son was killed in a weather-related aviation accident. The accident prompted Sloane to begin researching flying and weather. He began by constructing several working models of weather phenomenon, models that became permanent exhibits at the American Museum of Natural History in New York. A deepening interest in weather caused Eric Sloane to enroll in the Massachusetts Institute of Technology’s meteorology program, but he eventually left that program after becoming discouraged with the amount of mathematics needed to study meteorology. At one point Eric became so frustrated with trying to learn mathematics that he told his professor that the math was taking all of the romance out of the weather. Unphased, his professor told him that if it was romance in the weather Sloane was seeking, he ought to do it elsewhere – perhaps in the old farming diaries and almanacs. Taking the likely tongue-in-cheek comment of his professor seriously, Sloane began placing advertisements in Yankee magazine seeking to purchase farm diaries, journals and almanacs. It did not take long before his living room was overflowing with tattered books and musty smells. Pictured above: Alone at 12,000′ by Eric Sloane, N.A. 35.5″ x 53.5″, O/C. Sorry – Sold. 12 pane cherry corner cupboard, c. 1820. Pennsylvania, probably Northumberland, Montour, or Union County. Sorry – Sold. As he read each page, Eric Sloane did indeed find the romance in weather he was seeking – descriptions of “violent” showers and “sudden” storms that cleared with a “sweet smelling aire“. But Eric Sloane found much more in those pages. He read of the early American’s knowledge of wood, the seasons, the stars, as well as of weather predictions and lore. Immersed in the pages of wonderfully descriptive verse that spoke to him, Eric Sloane became fascinated by the life of the early American farmer. With thoughts of weather in his head and the picturesque New England countryside about him, Eric Sloane sought out the abandoned and nearly forgotten treasures of our early American landscape. It was his paintings of rural New England, Pennsylvania, and of Taos, New Mexico that made Eric Sloane a well-known, well-respected, and well-paid American artist throughout the 1970’s and early 1980’s. He exhibited internationally, was and is still represented in major national and international museums, and was elected to full membership to the National Academy of Design. One of the aspects of Eric Sloane’s life and career that is so compelling is that, within his lifetime, he was a highly successful painter, illustrator, author (he wrote over 40 books covering meteorology to bells), and designer. He also was a noted collector of American antiques (as I write this I am sitting on the delightful 18th century Connecticut arm chair which was a particular favorite of Eric’s) and of early American tools and farm implements, which he regarding as aesthetically pleasing as utilitarian. Eric’s research interests and collection of early American tools was a catalyst for the creation of the Sloane-Stanley Museum of Kent, Connecticut. The museum opened on May 28, 1969 and was enlarged and expanded in 1986. Autumn Clouds by Eric Sloane, N.A. O/P, 38.25″ wide x 28.25″ tall by site. 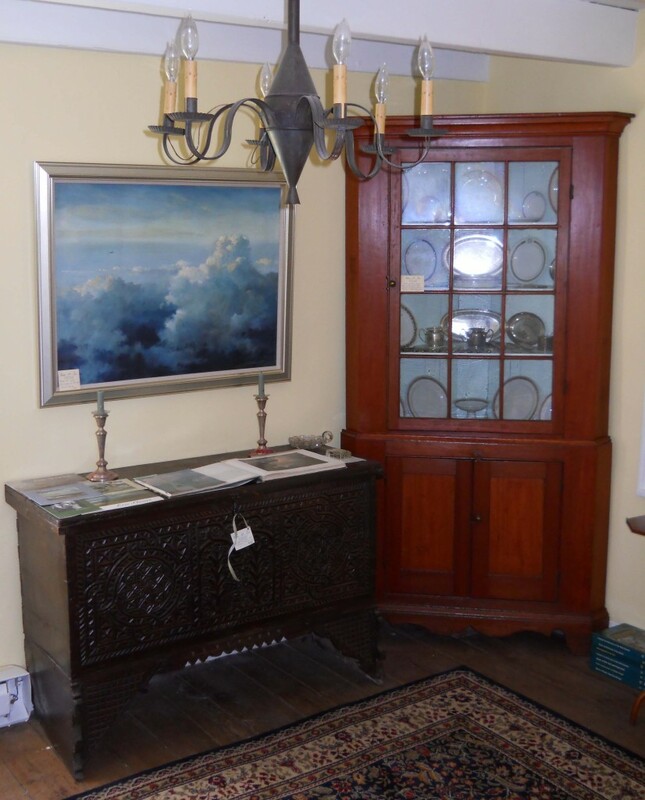 In excellent original condition housed in an original and exquisite Walter Skor frame. 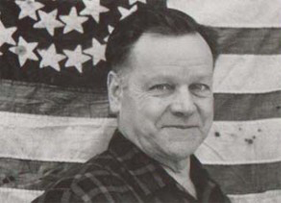 In his later years, Eric Sloane divided his time between his homes in Taos, New Mexico and Cornwall, Connecticut. He died on the streets of New York City on March 6, 1985 on the way to a luncheon engagement with his sixth wife Mimi, one week after his eightieth birthday and two days after the opening of his Hammer Gallery exhibit entitled “Eighty”. 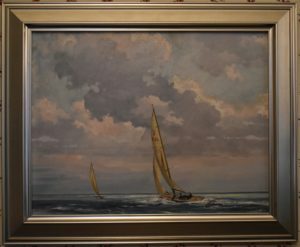 An example of our ability to restore works by Eric Sloane, West Wind came to us dirty, unvarnished, and with significant damage in the form of approximately a dozen white streaks running down the right side of the painting. The streaks were caused by a corrosive material – that material removed the paint down to the canvas. The picture on the right was taken after we cleaned, repaired, varnished, and re-framed the work. It is now a beautiful example of Eric’s skills in marine art and will delight viewers for many years to come.